DISCONNECT FROM THE MODERN WORLD in our charming 1950's cottage, filled with things from a simpler era. NO WIFI OR RECEPTION so TURN OFF YOUR DEVICES and spin some classic vinyl on the record player. Or enjoy soaking and star-gazing in the gorgeous outdoor fire-bath or in the free natural Hot-springs just 15 minutes away. Conveniently located on main highway between Hokitika and Franz Josef Glacier (50 mins each way) for easy day trips. Heaps of books, board games, puzzles, authentic memorabilia and vintage dress-ups for those wet West Coast days. Kid-friendly - cot, highchair, pram, toys, swings and bikes. This is an old cottage with it's own quirks, such as a bathroom just outside, through the laundry. It is for those who would appreciate an authentic historic experience of NZ's past - not a bland, empty motel room. 2 kms from Hari Hari village, in an area of great hiking, fishing, hunting, lake swimming and boating. Natural Hot Springs in the riverbed just 15 minutes away - one of the Coast's best kept secrets. Genuine West Coast hospitality from hosts who live next door but will respect your privacy. 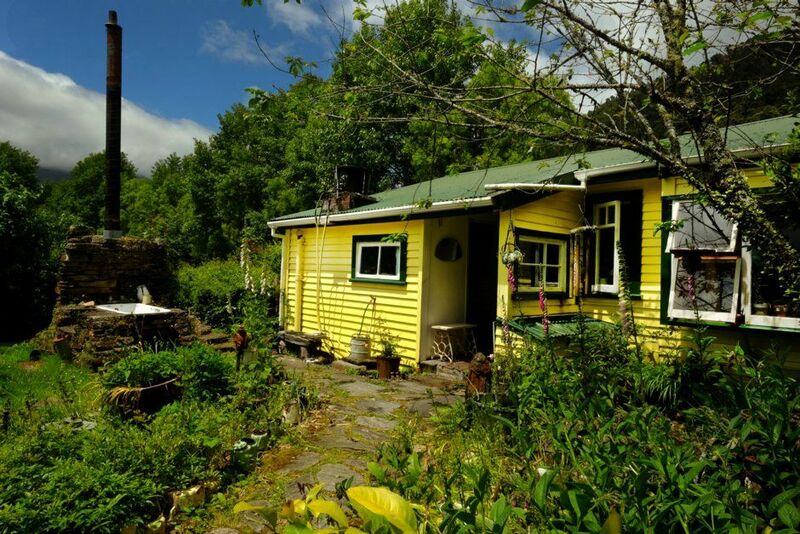 Teapot Cottage is on the same acre property as our other (completely different and off-grid) accommodation, 'Wildside Lodge'. Pets may be allowed with prior approval. We are a family of four, one friendly dog and one fat cat. We try to live on the "Wildside" as much as we can - hunting, fishing, growing, beekeeping and brewing - trying to be as self-sufficient as we can. We are usually happy to give a tour of the rest of our homestead to our guests if they are interested. Dan originally rented this cottage from his elderly neighbor next door then subdivided it off from her. After she passed away we bought her house and moved there to give our kids a little more room. We still miss the view from the cottage and the quaint "grandma's house" feeling, however, but luckily we can just walk 40 metres to enjoy it again! You can star-gaze together while soaking in the gorgeous garden fire-bath or try the natural mineral Hot-springs just 10 minutes away. Eat el-fresco in the cottage garden, with stunning rural/bush/mountain views. Turn off your phone and disconnect from the modern world. Everything an old-fashioned cook needs. Classic literature, children's stories and a range of non-fiction. Interesting concept and Kath very friendly and welcoming. As a holiday cottage found it very disappointing after reading glowing reviews - a case of the Emperor's New Clothes? etc; kitchen pots and pans, utensils, cutlery mostly unusable due to stains, corrosion; electrical wiring very old - when did it last have a safety check? ; shower room/toilet had holes in the floor giving easy access to widlife! ; door lock broken, bolt and padlock on exterior of door; generally in poor repair. Feel that Teapot Cottage has potential if it was decluttered, cleaned and presented well. Eg the period 3 piece suite, radiogram, harmonium all interesting but lost amongst the clutter. The Alice May restaurant in Franz Josef is a good example of how to present period artifacts well. All in all did not find it a comfortable place to stay so found alternative accommodation which was and was no more expensive than 'Teapot'. Had this guest raised any concerns at the time, or even advised us that he was leaving, he could have cancelled at least the 2nd two nights and received his money back as per our cancellation policy. Even when I noticed he was gone and emailed to make sure everything was ok he made no mention of any problem. Have taken steps to remedy mustiness, though in my experience, old houses never smell like new ones. Furthermore the listing states the cottage is "filled with things from a simpler era" (absolutely useable) and is an "authentic historic experience" - not just a display of the odd old thing on the wall. SO...JUDGE FOR YOURSELF from the photos and positive reviews from the past 7 years. Really cute and comfortable wee cottage. We stayed here for one night on a stopover heading south. This was the perfect place to settle down for the night. Kath had all the information handy for the house and for the walk up to the hot springs at the river. The cottage has a very old school charm with an old fashioned record player, fascinating bookshelf and a beautiful childrens room. We could have stayed longer. Thumbs up! A blast from the past and a nostalgic reminder of days gone by. Kath and Dan are very welcoming hosts and provide a truly rural, time warp experience away from the intrusions of city technology.We enjoyed the peaceful garden and birdsong, along with the cottage full of old time interests and belongings. Thank you for a very interesting stay. Step into the past for a few days. Property was very nice, clean with everything one could need for comfortable stay. Property was very nice, clean with everything one could need for comfortable stay. We were very happy to spend a night there. Thank you. Natural Hot-springs in the riverbed just 10 minutes away. Conveniently located for easy day trips to Franz Josef for glacier watching or Hokitika for greenstone, gorge, wildlife centre, tree-top walkway, museum and more. Great local walks such as the Hari Hari Coastal Walkway. Light a bonfire on the beach or bird-watch in the lagoon. Renowned trout fishing streams, lake and river fishing, surf-casting and whitebaiting (Sep-Nov) - Ask about our guided fishing. Excellent hunting and weekly bow-hunting club. Plenty of quiet bush-roads for mountain-biking.